In the latter days of the Nintendo 64, Nintendo set up Marigul Management, a division that promoted small developers to come up with original game concepts with first-party publishing contracts. 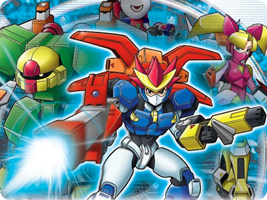 The longest-running series to come out of this has been Custom Robo, developed by Noise. You have to build a mini battle robot and battle against others in 3D arenas in order to win more parts to power up your robo further. While there are many Custom Robos to choose from, it is Ray who is the best known figurehead in the series.